Pass your thumbs away from you, under the figure, and at the same time point your fingers toward you so that your palms face upward. At this point, the diamonds will lie parallel to the ground seen in the figure below. Note the half twist in each thumb loop. On each hand, transfer the half-twisted thumb loop to your little finger, maintaining the half twist throughout the transfer. On each hand, pass your thumb over both index strings, pick up the near little finger string, and return. Now finish by completing the extension phase of Osage Two Diamonds. The result is Six Diamonds, but with unusual wraps between diamonds 1-2 and 5-6. The power lift is a technique for improving the extension of figures that tend to collapse when drawn taut. The technique can be applied to any figure in which only four loops are present on the hands in the final extension. It is most effective when the string is thin and somewhat slippery (nylon, satin, or silk). Make and extend a diamond figure (here i use jacob’s ladder as an example). Turn your hands inward so that your palms are facing you. With the help of the opposite hand remove the index loop, untwist it by rotating it a half turn away from you, and place it on the little finger. The diamonds now lie parallel to the ground and the loop on each thumb and little finger is free of twists. On each hand, with your thumb pick up the near little finger string, close to the little finger, (the string is very short! ), and return. 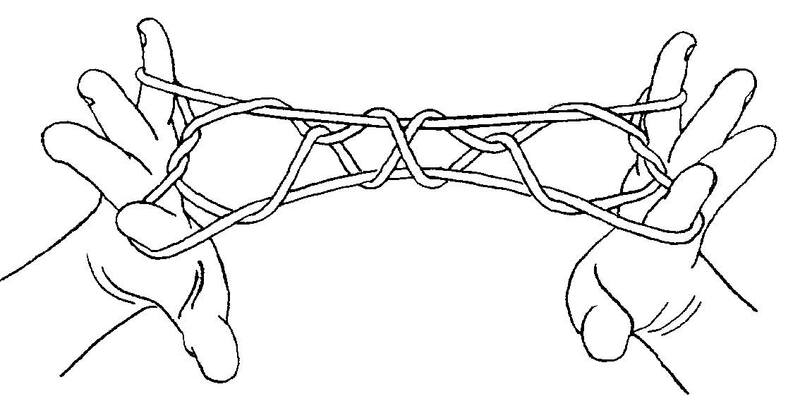 On each hand, bring the index and middle finger toward you, over both strings of the upper thumb loop, and using them as “pincers,” sandwich the lower near thumb string between the two fingers, then wrap the string around the tip of the index by rotating the pair away from you and up, lifting the string over the upper thumb loop as you straighten the fingers. 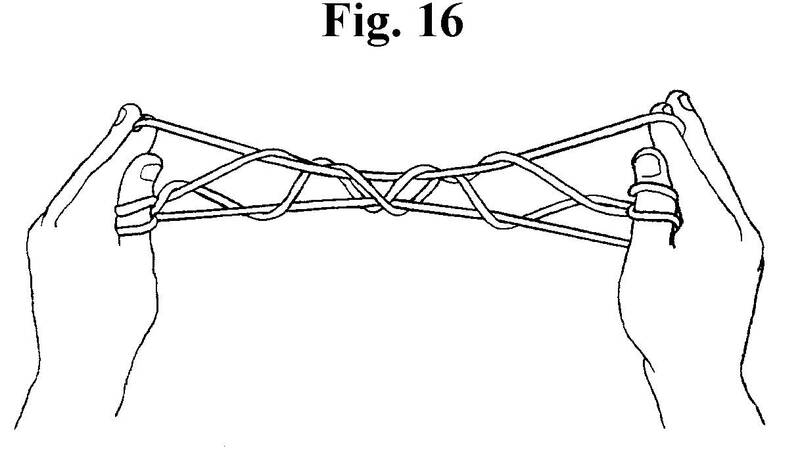 Separate the index and little fingers as far as possible, while simultaneously pushing the thumbs towards the center of the figure (note that each thumb is held tightly by two circlets of string). With a little practice, the figure will spring dramatically to life. One can even make the figure “dance” by sliding the thumbs back and forth across the surface of the design. I CANNOT OVEREMPHASIZE THE UTILITY OF THE POWER LIFT FOR REVEALING THE INNER BEAUTY OF MANY COMPLEX DESIGNS. All of my students are encouraged to master it at an early stage in their learning.